If you are looking information about how to Backup and Reset for the HTC Desire 700 Dual SIM smartphone, you can read the HTC Desire 700 Dual SIM manual on page 113. The manual has been published by HTC manufacturer. It's available in pdf format and english language. The HTC Desire 700 Dual has physical dimensions of 145.5 x 72 x 10.3 mm with weight about 149 g. It has 5.0 inches capacitive touchscreen display with a resolution of 540 x 960 pixels. This smartphone is powered by 1.2 GHz dual core processor, Spreadtrum Shark mali-400 chipset. It's instlled Android 4.1.2 Jelly Bean operating system. The phone equipped with 8 GB internal storage, 1 GB of RAM, microSD up to 64 GB, and 8 MP rear facing camera. In addition also equipped with 2.1 MP front facing camera and powered by Li-P0 2100 mAH battery capacity. 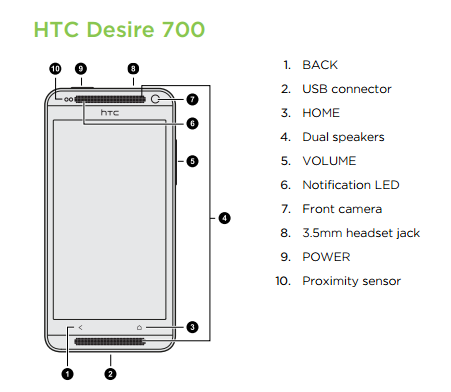 The HTC Desire 700 Dual SIM user manual has 179 pages with file size of 2.82 MB. It's provided detail reference information such as phone part overview, Inserting the storage card, SIM card, Switching the power on or off on page 15, Setting up phone on page 15, using home screen on page 20, Updating the HTC Desire 700 software, Getting apps from Google Play, Downloading apps from the web, installing the battery, SIM Card,usingh camera on page 46, photogrphy tutorial, recording video guide, Taking HTC Zoe photos, using HDR, Recording videos in slow motion, using Gallery. Then about Making HTC Desire 700 truly yours, Changing your wallpaper, Adding a widget to your Home screen, Setting up a face unlock on your phone, Making a call with Smart dial, Setting up a conference call, using messages, Searching HTC Desire 700 and the Web, Listening to FM Radio, Sharing your media on DLNA devices, Dropbox integration, HTC Sync Manager, bckup and reset, Setting up your profile, Importing or copying contacts, Using the Clock, using maps and HTC Car, Using HTC Desire 700 as a wireless router, Sharing your phone's Internet connection by USB tethering, using bluetooth and wi-fi, using wi-fi printer, settings guide like Adjusting the time before the screen turns off, Assigning a PIN to help protect your SIM card, Setting a screen lock to help protect HTC Desire 700, Checking your phone's HTC Sense version, and more. Connect HTC Desire 700 to a supported printer via Wi‑Fi and print out documents, email, photos, and more. Both printer and HTC Desire 700 must be turned on and connected to the same local network. Connect HTC Desire 700 to the local network using Wi‑Fi. 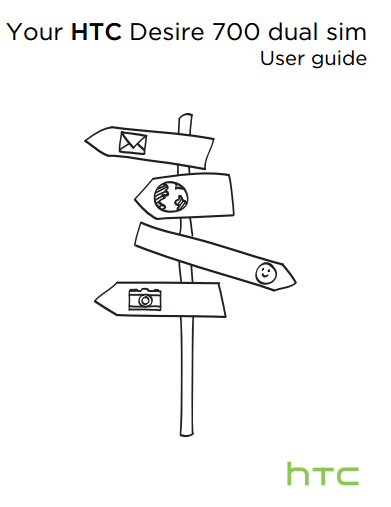 To learn how to connect the printer to a local network, refer to your printer user guide. While in an app (such as Mail or Calendar), open the item you want to print. Tap > Print (or More > Print). On the Print screen, tap the printer you want to use. If there's more than one page to print, set the page range that you want. If you used HTC Backup to back up HTC Desire 700, you can restore your content after a factory reset, or to a new HTC phone over Wi‑Fi. Turn on your phone, choose to restore content, and then select Restore from HTC Backup on the Set up phone screen. Sign in using your HTC Account or Facebook, depending on which account you used to back up your phone before. Sign in to Dropbox, and choose to allow HTC Backup to access Dropbox. Your backup history will then be displayed. Select a backup, and then tap Next. Wait for your accounts and settings to be restored. Tap OK to continue restoring your previously installed apps.